This highly sensitive mobile phone detection monitor is discreet while it monitors 24-7 perimeter security for all nearby mobile phone activity. WatchHound features audible and visible alerts. It also connects to any ethernet for networked security monitoring throughout an entire facility. This award-winning* TSCM receiver features an ultra-crisp OLED display, remote control and utilises Power (PoE) over Ethernet or from the included AC power supply. Audible alerts are relayed over the internal speaker, headphone output or create a custom alert to be triggered via the dry contact port. For more intense security alerts, consider WallHound to detect and also deter visitors and staff from using any mobile phones or bluetooth. WatchHound’s simple thumbstick/push button control allows any security personnel to easily set threshold levels, check past mobile phone activity and detect all voice, text and cellular data triggers in realtime. *Standby mode (autonomous registration) varies from base station to base station with phones typically registering between once every few minutes to up to 20 minutes. This time varies greatly based upon carriers, distance from base stations and individual handset manufacturers’ standards. *WatchHound ships to that region as the default but may be switched to other supported regions at anytime by the user using the included utility software. Can the WatchHound be used to locate mobile phones? No, because the WatchHound unit is deployed on a fixed wall, which precludes the possibility to “triangulate” the source of RF signals. By contrast, a hand-held mobile detector can locate mobile phones by taking two or more bearings (or, Lines of Position) of the source. Can many WatchHound units be used to monitor a large area simultaneously? Yes, this is possible by deploying the WatchHound Application Software package which allows the user to monitor multiple WatchHound units from a PC screen. Can the WatchHound run out of power? No, because the WatchHound does not use batteries, it derives its power either over a PoE Ethernet port or is powered by an AC adaptor. In addition, WatchHound can also include an external (hidden behind unit) optional 8000mAh battery pack. Can the WatchHound store data? No because it does not have to, since it is networked over Ethernet. What kind of antenna is used by the WatchHound? The WatchHound can be deployed either by an Omnidirectional or Directional antenna. When deployed at large inner open spaces the Omnidirectional antenna would be used. When deployed in corridors or otherwise constricted spaces a Directional antenna could be more efficient. Does the WatchHound provide audible or visual alerts? Yes, it will provide a voice alert as well as a visual alert on its LCD display. Does the WatchHound Mobile Phone Monitor identify callers or their phone numbers? No. WatchHound Mobile Phone Monitor is a simple, low-cost scanning device that simply identifies and timestamps nearby mobile phone activity from a fixed point. It is a wireless tool used by security officers and personnel that require a NO WIRELESS security policy. Can WatchHound track phone numbers or IMEI codes? No, WatchHound only detects RF signals. How far away can I detect cellphones? 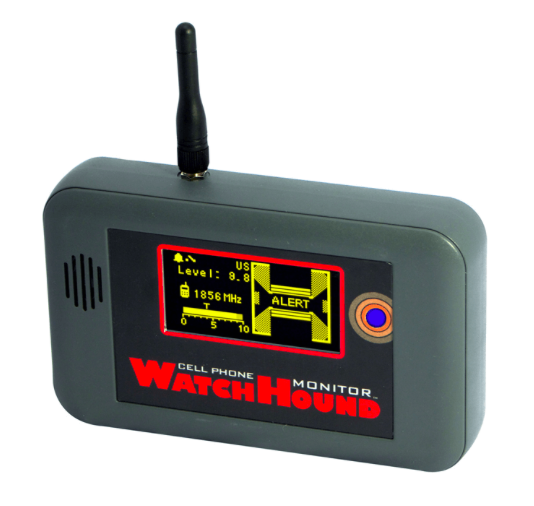 Does WatchHound Mobile Phone Detector detect phones that are powered off?